Most of us would initially balk at this question. ‘I belong to no one!’ we might exclaim. Our society places much value on independence and individuality, and the idea of ‘belonging’ to anyone might seem oppressive. But if we shift our definition of belonging from ‘being possessed by’ to ‘being a part of’, it changes the meaning. In fact, we have no problem saying we belong to a family, a team, a club, or a parish. And unfortunately, we even use our sense of belonging to create division among us. Think of the conflicts that arise between those who belong to different political parties, races, or religions. The groups or individuals we choose to affiliate with certainly color our lives and our perspectives. How might our perspectives change if our primary allegiance was our belongingness to God? And how might our view of others change if we acknowledged their inclusion in this divinely appointed group? On September 27th, the Church celebrated the feast day of St. Vincent de Paul. Together with Louise de Marillac, Vincent and Louise were the founding father and mother of the Charity charism. Both of these holy people recognized the indwelling presence of God in each and every person. In other words, they recognized every person’s belongingness to God. This reality colored the world they saw. 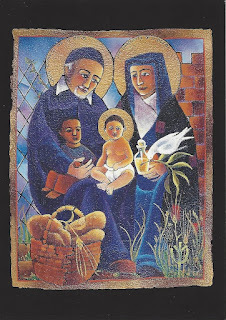 Vincent and Louise dedicated their ministries, and the ministries of their congregations, to the service and evangelization of the poor. For them, no person was outside the bounds of charity, because all belonged to God. Similarly, Vincent and Louise found the strength and conviction to do their work because they recognized their own belonging to God. My own journey in religious life has been a path of discovering not only who I am, but whose I am. As a second year novice, I have spent the past several months studying the evangelical vows of poverty, obedience and consecrated celibacy. In my exploration of the deeper meaning of the vows, I found at the core of each vow is relationship. Each vow provides a framework for how I am to relate to things of the world, to other people, and most importantly, to God. They define my belongingness to God. Just yesterday, I received approval from my congregation’s leadership council to profess my fist vows as a Sister of Charity of Cincinnati. When I stand in front of my Sisters, family and friends and publically vow to God poverty, obedience and celibacy, I will claim my belongingness to God, and will promise to let this reality color every aspect of my life. Oh, Annie, this is delightful news this am that S Joan sends to us!! I'm sure there I much heavenly celebration!! Congratulations Sister Annie!! Love you! !